This post is a little bit retro, so bear with me. In the Suzuki-guitar Facebook group, a teacher asked for suggestions to give to a parent whose child has a hard time learning the song names in Book 1. Ideally, the volume on these should be a hair lower to balance better with the songs. But we lived with it. You could reduce the volume yourself in an audio editor like Audacity. I recorded the singing in Audacity with a crummy headset mike, and I’m not the world’s best singer, so these song intros are not high art. But I can keep a tune, and after hearing these intros many times, everyone in the family (including my wife, who is not the Suzuki parent) knows the names of the Book 1 songs. Click a song’s name in the playlist. The song will load in the player and will soon start playing. You should see the words “Download MP3” under the song name. Right-click “Download MP3” and save the file to your computer. Today we worked on right-hand technique, and I took several videos during our practice as teaching tools. M has some habits that need changing — she plays from her elbow or wrist, not from her knuckles, and she plays from the underside of her nails — and I took these videos to help her see what she is doing and what she needs to change. Thursday: We had some rough moments, but we stayed out of disaster territory. Next, I tried to get through the first two pages of Dan Fox’s Rhythm Bible at 72 bpm, which is faster than we’ve done before. M did pretty well on page 1, though she made a careless mistake in the third-to-last measure. 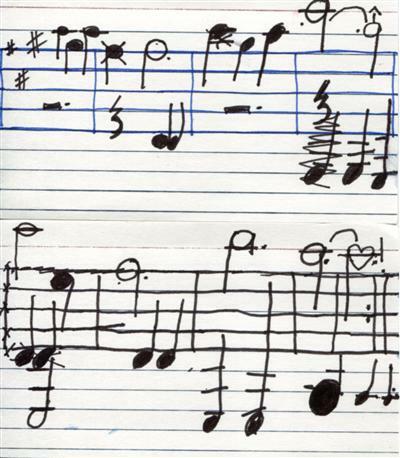 When we moved to the second page, though, she was paying less attention, and clapped quarter notes for a half note. When I stopped her, she petulantly denied having made any mistake. She wanted to argue about it, so I decided to move on to something else. I asked her to start with the Bach Tanz, playing it with a metronome. She started on autopilot, but then turned her mind to the piece and did a nice job. She did a few more repetitions, and her mind was wandering further and further from her playing, to the point where she started messing up the structure. We got into a little bit of a standoff when I told we would move on to something new as soon as she played with better concentration than the previous time. When I could tell she was playing on autopilot, I stopped her, and she didn’t like that. After a standoff (she sat holding her guitar; I told her she had to sit there until she played another repetition with good concentration), she played it through passably once. She didn’t actually show better concentration than the repetition I told her to improve on, but I didn’t think I was going to get what I asked for no matter how long I kept her at it, so we moved on. Next she played the Meadow Minuet, also with the metronome. (At one point M suggested drawing a bunch of metronome people, and I suggested she draw “metrognomes.” She liked that (after I explained the silent “g”).) It was only okay; she stared into space most of the time she was playing. Thinking that she might concentrate better on something new, I asked her to work on the first four bars of A Toye. The first time through, she picked her own pace. It was too fast, but she did better than I would have expected. I got her to slow down and play with the metronome, and playing all 4 bars seemed to be working — until it wasn’t. At some point, the second two bars became a train wreck. So then we focused just on those. After a few repetitions, it was time to be done so M could have a shower. M finished by playing the first 4 bars of A Toye for her mom, which was adorable. Saturday: M practiced with her quartet, then had her private lesson. I wasn’t thrilled with M’s behavior during the lesson (she was sloppy with her guitar when she wasn’t playing), but it wasn’t too bad. Her teacher started us on A Toye, pointing out the importance of shifting between 1st and 2nd positions. She had an especially charming way of making the point about shifting. She put a little puppet on her thumb, and the puppet peeked over the guitar neck. When she shifted, the puppet shifted with her. Then she demonstrated not shifting — i.e., rotating the left hand to stretch the fingers — and the puppet fell back behind the neck as her thumb rotated. It was memorable! Sunday: In the afternoon, M played a house concert for a friend of her mom’s who grew up playing Suzuki violin (and who now plays fiddle and sings). M played the Bach Tanz and Meadow Minuet. She got the form of both right, which has probably been my biggest concern, so that’s good. In light of the concert, I told M we’d have a very short lesson. To improve the chance of her cooperating with me, I came up with this plan at dinner. We ate early, which left us some time. So I proposed that we all make cookies, then while they were baking, M and I would practice. If it went well — and only if it went well — we would eat a cookie after practice. This isn’t a straight-up bribe, because we were going to eat them anyway, but it created a clear incentive for cooperation. And it worked. We practiced A Toye for about 1/2 an hour, and M did a nice job on the melody of the first four bars. Then she played Allegro and Long, Long Ago (which has been out of rotation). She paid good attention on both. Friday: Despite a long day, M and I had another nice lesson. We worked on the C and D sections of Meadow Minuet. M had her last day of YMCA camp today. A while after I picked her up, she reported, “I cried today. We were in the woods and I got lost and started crying.” Yikes! I’d cry too if I were six years old and lost in the woods. She must not have been lost long, though, because the staff didn’t mention it to me. This was a nice start to our lesson, because it reinforced the fact that the entire section—not just the first half—has bass notes in it. She has developed an odd habit of playing the first four bars with bass notes and the last five without, and I wanted to work on fixing this today. We got home at about 7:30, which didn’t leave a lot of time for practice, particularly since she (quite reasonably) wanted to change into cooler clothes. But we also arrived home to find that M’s djembe was on the porch, so I was able to dangle this out as a reward: If she cooperated and we finished on time, I’d let her open the box and try out the djembe. We practiced for about a half an hour, focusing first on the D section of Meadow Minuet and then on the C and D sections together. I asked M a lot of questions after each repetition about how she thought she did; often she just guessed, but she also sometimes answered accurately, showing that she was listening to herself. The primary technical point we worked on was holding down the melody notes long enough. She’s in the habit of leaving a note early whenever the next note involves a shift. She was resistant to me at first when I tried to correct the behavior by holding down her left-hand finger when she tried to pull it off too early, but after I demonstrated the difference between picking up early and holding down long enough, she seemed to try to hold the notes down and play more legato. Here’s an audio file of today’s last two repetitions of the Meadow Minuet C and D sections, with discussion afterwards. She finished by playing Lightly Row twice. The first time, she sort of phoned it in (didn’t play with all the dynamics and rushed the tempo from the middle to the end, seemingly to get it over with). But the second time, she played with much more attention. The tan man, the tan man, asks the people their favorite color. And they say “tan,” and he is very popular. The next day the tan man, the tan man, asks the people their favorite color. But they say “pink,” and now his business is not so good. So the tan man changes his color and becomes pink. And the tan man is very popular again. Played French Folk Song for the first time in probably six months. I posted Strawberry Popsicle with the rest of the Twinkles. But far from being rusty, it was better than ever. This is a good reminder that significant breaks are sometimes helpful (as long as you’re still doing lots of listening during the breaks) — they give the mind time to process things. I have posted below her performance of With Steady Hands, along with our post-song discussion. I’m getting in the habit of asking her to self-evaluate, and she can pretty reliably identify key areas to work on. Today, she forgot to introduce dynamic contrast — but she knew it. Second, when (about 1 minute in) she couldn’t find a particular note, she listened her way to the right note (with only a little help from me). I’m posting the French Folk Song portion of our lesson below too. Today we recorded some more of the Twinkles in preparation for the Suzuki Association of Minnesota graduations in March. We forgot Ice Cream Cone, but we got most of the rest pretty well. And apart from a brief meltdown at the end of the lesson (at almost 6:45, when I asked M to run through Wish I Had a Little Pony a second time), M was cooperative and paid good attention. if we had enough time after finishing, we would be able to have some ice cream — but whether we would have enough time was up to her, because it depended on how she cooperated. Sadly, as I listen to these again, I notice that I forgot to turn off the furnace for at least two recordings (Strawberry Popsicle and Theme). Dang it! Update 25 January 2011: It’s taken three more days of trying, but we finally got a good take of Ice Cream Cone and a much-improved, furnace-free take of Theme. We also got an improved take of Strawberry Popsicle, but I think M can do better. Update 28 January 2011: Now we’ve got a decent Strawberry Popsicle. The player below has the best recording of each variation. All done!